1 Combine Hellmann's® or Best Foods® Real Mayonnaise, sour cream, green onions, basil, lemon juice, salt and lemon peel in small bowl. Chill until ready to serve. 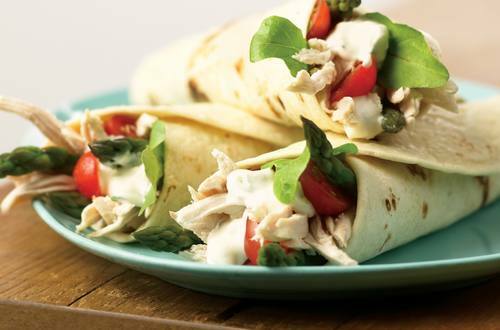 2 Arrange chicken, asparagus and tomatoes on tortillas, then top with mayonnaise mixture. Roll up and garnish, if desired, with mixed greens.